A pile of concrete greeted me on my return after a recent holiday. I reassured my neighbour that I was delighted with my early Christmas gift and within a couple of weeks it had found a new home beneath my own washing line. Now all I need is some sand so that I can level it when the weather gets a bit cooler. 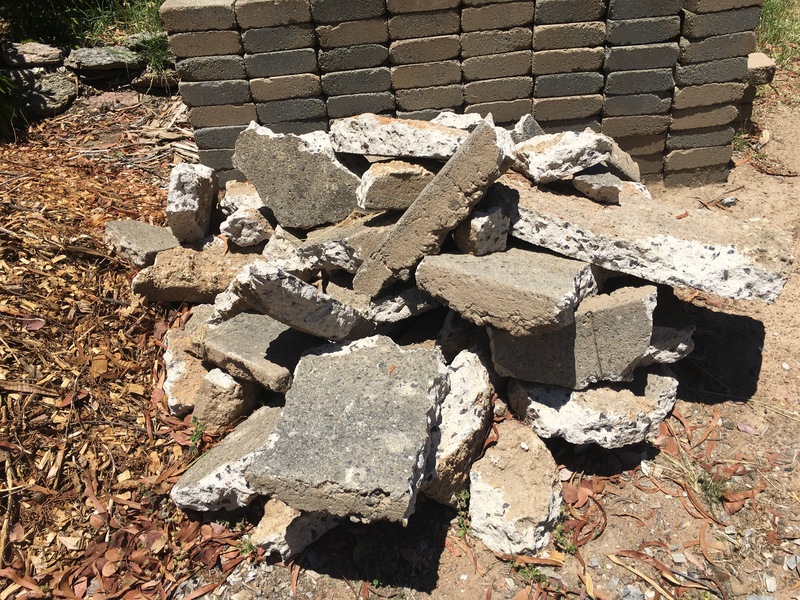 It takes a surprising amount of brain power to turn a pile of odd-shaped concrete blocks into crazy paving. There are almost limitless possibilities and no wrong or right solutions. It’s even harder when the pieces are all different thicknesses and colours. Some people do sudoku or crosswords and go to the gym but I love the satisfaction of having a mind and body workout AND creating a bushfire- and termite-proof path. 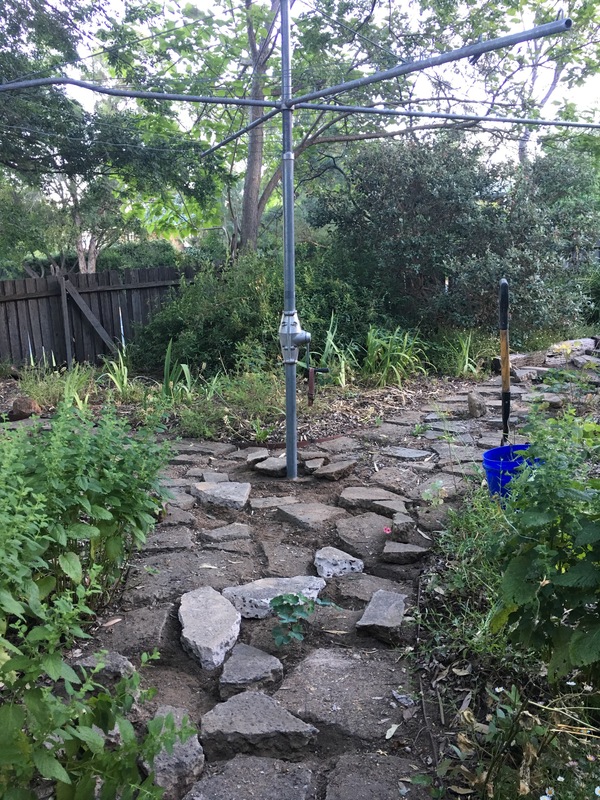 Eventually I also want to replace the remaining railway sleepers with dry stone walls and steps that will provide the native bees and tiny lizards with new homes. So now I’m planning to ask Santa for a new back fence instead. ‹ Should the tampon tax be abolished? Really nice to read about such a brilliant recycling project and the garden is looking great! I love it! 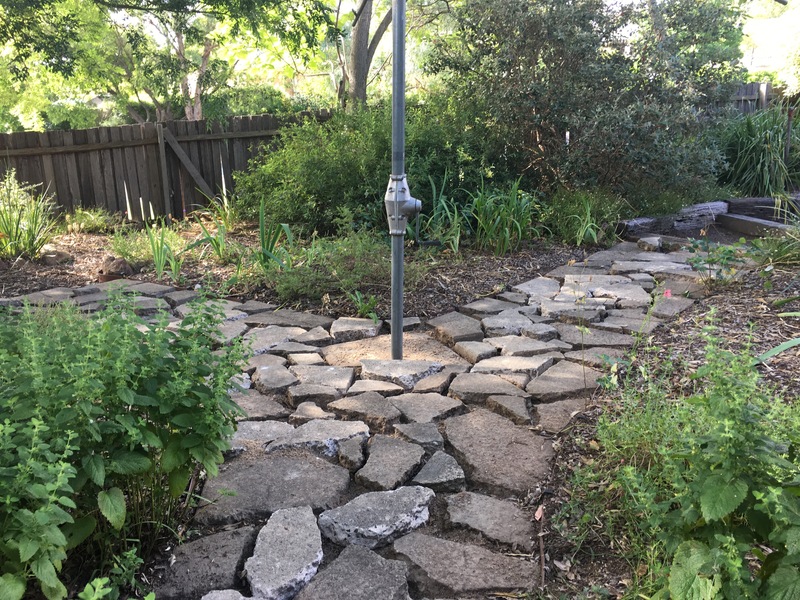 I’ve been collecting flat stones for a path, but had also repurposed some concrete that used to be a walkway I had to have replaced, plus some pieces that were once under the downspouts. (let no good stone go unturned, right?) Some spreading thyme between stepping stones is nice too. You’re darn funny, without even trying. Nice read. Thanks. That’s like the ultimate compliment as far as I’m concerned. You’re infectious; top marks. I’ll be back. Cheers.